Custom Personalized Magnetic Bookmarks in Bulk And Print in Full color. Lowest prices in USA and Canada. 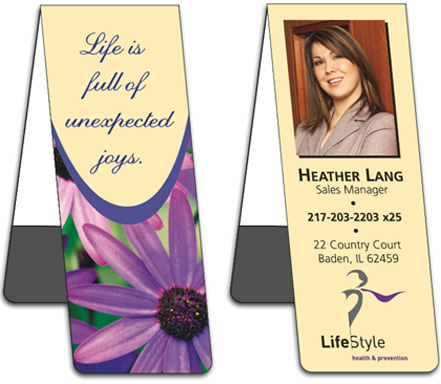 High quality, yet inexpensive Magnetic Bookmarks in bulk, customized with you logo. Free artwork design and Free proofs! American clients pay no taxes. Have you ever used a bookmark that has fallen out or been misplaced? Here is a magnetic bookmark that is designed to stay in place so you can easily return back to the correct page. The fold in the bookmark allows the magnet to clamp securely to the opposing side, creating a secure grip on your place. Multi-color options are available to allow for an attractive item that any book club or library can use to benefit themselves in terms of advertising, or special events. Post your hours of operation or upcoming events or dates relative to special events for you organization. Promote an author, a book club, your local PTA or school group. The possibilities are endless. The unit prices below include your full color custom imprint on one side. The magnet on the inside of these handy bookmarks always holds the right page, letting you get right back to where you left off. Imprint Bleed: Art intended to print to the edge must extend 3/32" outside cut line. Art not intended to print to the edge must remain 3/32" inside cut line. Imprint Area: 8" H X 1.5" W (the entire magnetic bookmark). Our magnets are Eco-Friendly. 70% recycled magnet! By weight they are 70% strontium ferrite. This material is a by-product of iron oxide created during the steel making process and therefore recycled material.